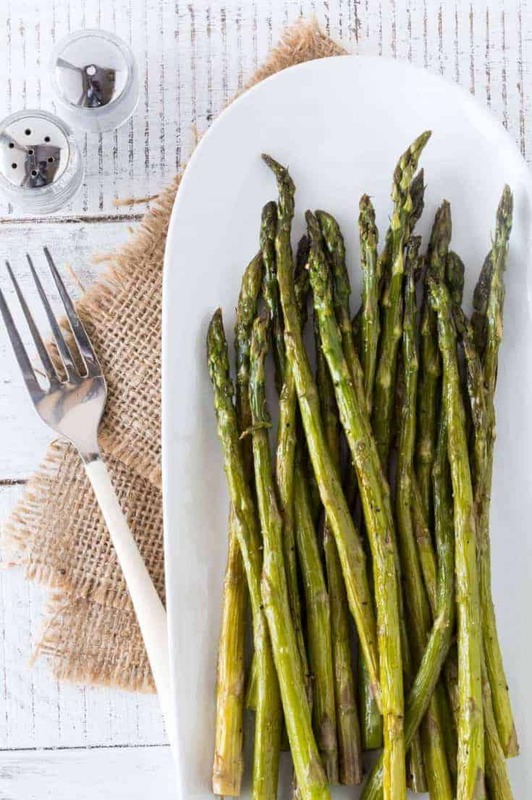 Stock up on ALL the asparagus because this Oven Roasted Asparagus Recipe with Brown Butter is an easy spring side dish that you’ll make all season long! I’m not sure what I’m more excited for this spring: seeing my yard again after a long winter of snow or all the spring produce flooding the market. 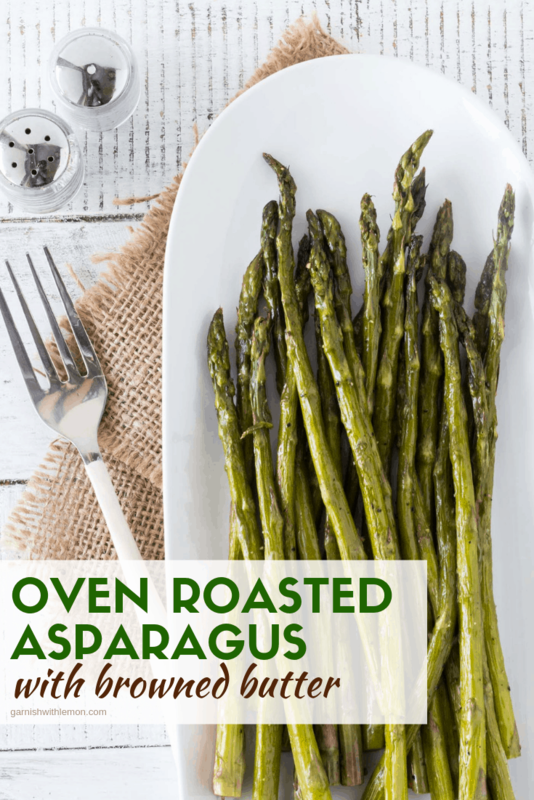 Asparagus is one of my favorite spring vegetables, and we make this Oven Roasted Asparagus Recipe with Brown Butter on repeat for most of April. It’s a simple spring side dish tossed with just a little bit of fancy in the form of a decadent brown butter, balsamic vinegar and soy sauce. This Oven Roasted Asparagus Recipe with Brown Butter comes together quickly. 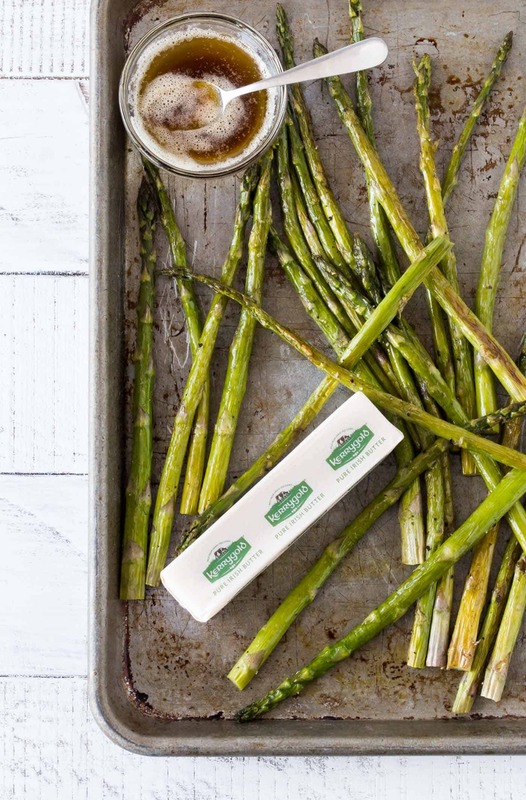 With only five ingredients, I highly recommend using the best ingredients you can, which is why I chose to use our favorite grass-fed butter from Kerrygold in this roasted asparagus recipe. You can cook the brown butter sauce while the asparagus is roasting making this recipe come together in 15 minutes. How is that for a quick and easy spring side dish? The tricky part about cooking asparagus in the oven is roasting the spears enough so they are not still raw and super crunchy but not so much that they are wimpy and overcooked. So what is the key to evenly roasted asparagus? Seek out spears that are the same size. A lot of asparagus bundles have a variety of spear sizes (thin and thick). Do your best to find a bundle of consistently-sized spears because asparagus spears of the same size are done roasting at the same time. If you do end up with a bundle of different sized asparagus spears, keep an eye on them in the oven and remove thin, roasted spears before the thicker ones. Crowded vegetables don’t roast; they steam. So make sure to give your asparagus enough room on the pan. It’s tempting to dump the whole big lot on the pan break out two pans if needed to give your Oven Roasted Asparagus enough room to get nice and browned with a few crispy edges (The best part of any roasted vegetable, in my opinion!). Making brown butter isn’t hard and it doesn’t take long but you need to be attentive the whole time because the butter can change from browned to burned in seconds. 1. Start with a light colored or stainless steel skillet. Having a light colored pan versus a dark interior will help you see the transformation of the butter color more easily. 2. Add your butter to the skillet and cook over medium heat for 4-5 minutes, stirring occasionally. You’ll see the butter foam and the milk solids darken and fall to the bottom of the pan. 3. There are varying opinions to how dark to let your butter brown, but I usually pull my pan off the stove when the butter is a deep amber color. Like I mentioned above, a skillet with a light interior (or stainless steel) is the best way to tell how quickly the butter is browning. I have a Green Pan with a light interior that I love to use to make brown butter (among other things). Lisa and I LOVE these sheet pans. They are sturdy and don’t warp in the oven like cheaper pans do. They are also made in the USA. How many times you have gone looking for the right-sized measuring spoon? These magnetic measuring spoons ensure I always have the right spoon when I need it. If you’re a blue cheese lover, this tasty Sautéed Asparagus with Melted Gorgonzola and Pine Nuts recipe is for you! A punch of citrus flavor turns this Roasted Asparagus with Lemon Vinaigrette into the perfect spring side dish. This cold Chopped Asparagus Salad would be a delicious addition to any backyard BBQ spread. Place asparagus on a large baking sheet and spray spears with cooking spray. Sprinkle with desired amount of salt and pepper. Roast in oven for 20-25 minutes, depending on the thickness of your asparagus. You want them tender but not shriveled. Remove from oven and set aside. Add butter to a small skillet and cook over medium heat for 4-5 minutes, stirring the butter or shaking the pan occasionally. (If you're using a stainless steel skillet, you'll see the color start to change to an amber color.) Immediately remove from heat and stir in the soy sauce and balsamic vinegar. Pour over asparagus and toss to coat. Serve warm. Thanks for the shout-out, your asparagus looks delicious!